We did quite a bit in the few days we were there. In addition to eating really well, we visited the Doge’s Palace, the Correr Museum, St. Mark’s Basilica, San Giorgio, the Accademia, (this is the point when we got the news about Marlowe’s kidney failure), Ca’Rezzonico, the Peggy Guggenheim Museum, and rode the vaporetto, and walked a lot. 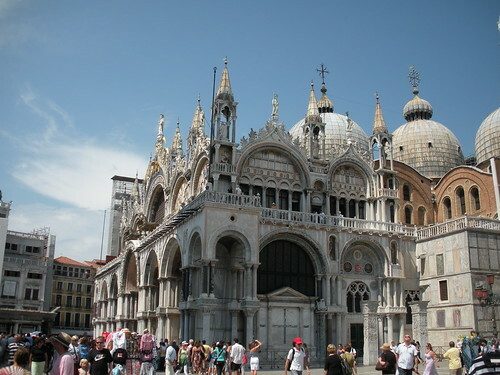 The main thing I learned about Venice is that this island city-state pretty much stole everything of value that it has from Byzantium and other nearby states during the Renaissance. Venice was a major Mediterranean power and controlled trade wit the East. 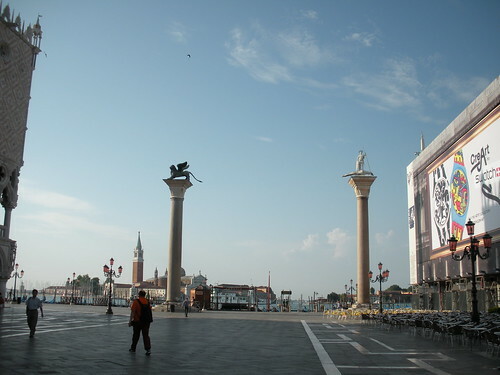 So, naturally, its leaders took whatever they could get, including the remains of St. Mark. 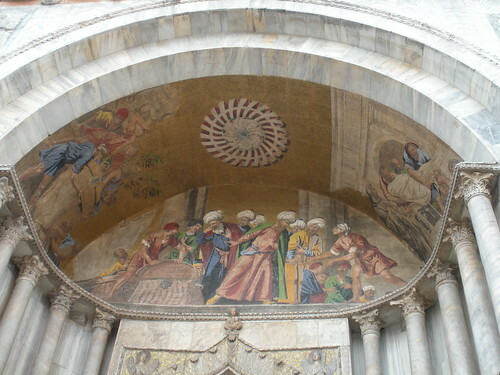 Paintings on the outside of St. Mark’s Basilica, like the one pictured here, depict the smuggling of St, Mark’s body out of Egypt in the 9th century. 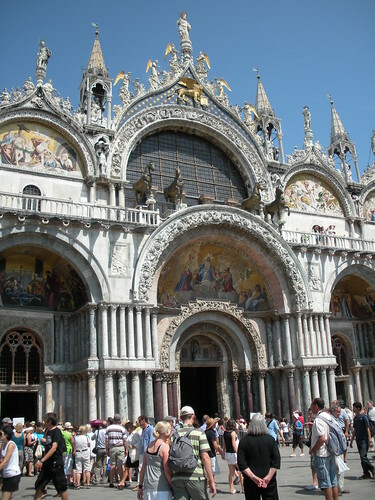 The basilica was definitely worth a visit. The mosaics in the ceiling are amazing, especially the one of the Pentecost in the main part of the church. It depicts the apostles and Mary being filled with the Holy Spirit on the day of Pentecost. What’s so beautiful about the mosaic is the combination of gold and blues. It looks really expensive. It’s difficult to imagine just how costly these works of art were. You can also pay a small fee to go behind the altar and see Golden Altarpiece. We did this and paid to go up into the museum. (We didn’t pay to see the treasury.) We thought both of these were worth the two or three euros (or whatever it was) we paid to see them. The Golden Altarpiece is just what the name suggested, a beautiful golden altarpiece encrusted with all kinds of jewels and depicting Christ and the prophets. 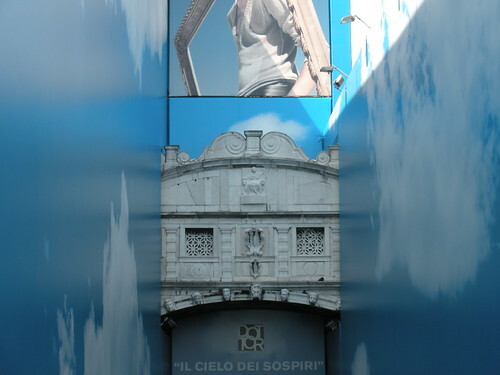 The museum is on the second floor of the church. 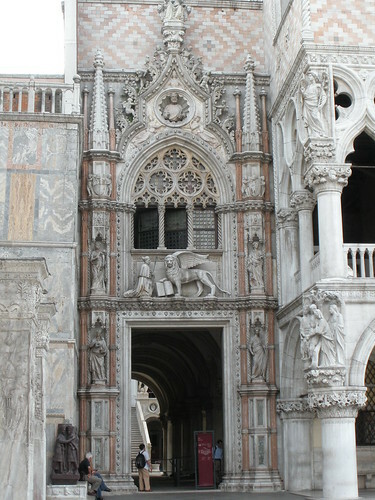 If you go in to it, you can also walk out on the balcony overlooking St. Mark’s Square. I don’t do well with heights, but I liked this one, as long as I didn’t get too close to the edge. 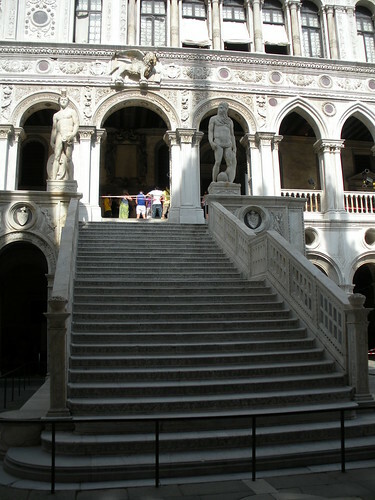 I also enjoyed our visit to the Doge’s Palace. What I learned here is that I should have been a doge. Doges were elected leaders, often chosen for their advanced age or lack of power, who governed the city along with six advisers, the senate, and the dreaded council of ten, a committee (actually of seventeen people — the ten council members plus the doge and his six advisers) that sat in judgment over accused traitors, murderers, and violators of morality. Their “justice” was swift, hard, and secretive. In fact, there’s a hidden door that leads from the council room to the dungeons; convicted criminals were immediately led through this door to their doom. The doge also got to wear a great hat. Throughout the palace there are paintings of various doges in their hats. I’m really jealous that deans don’t get to wear special, funny shaped hats all the time! The reason it looks like this is that the exterior is being renovated. What Venice does is allow companies that help pay for the renovation to advertise on the outside of the building being renovated while the work is being done. So, the Bridge of Sighs has become, in effect, the Bridge of Signs. 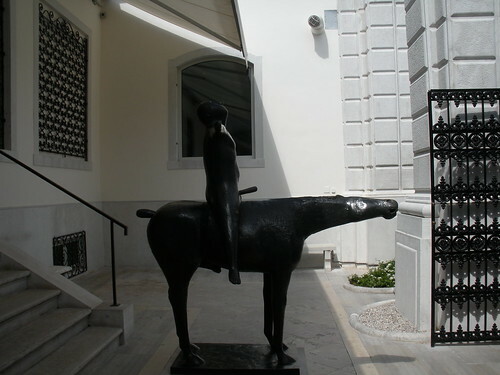 This sculpture is Marino Marini’s The Angel of the City. And yes that’s an erection poking out from the front of the man. Apparently, it used to be detachable, but when someone stole it Guggenheim had it welded on permanently. It was really refreshing to visit this museum. For the first time, I felt like I had some little sense of what it must have been like to experience modern art when it first hit the art scene. After a week of pre-twentieth-century art, I felt that I could really appreciate these modern works’ daring, experimentation, and joy. These twelfth-century columns support two statues. 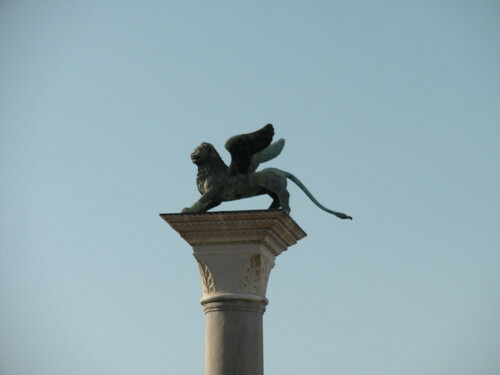 One is St. Mark’s lion, the body of which is said to be more than 2,000 years old. 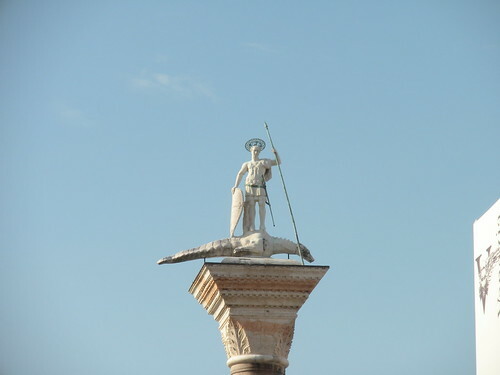 The second one is of St. Theodore fighting a crocodile. St. Theodore was the city’s patron saint until he was replaced by St. Mark. 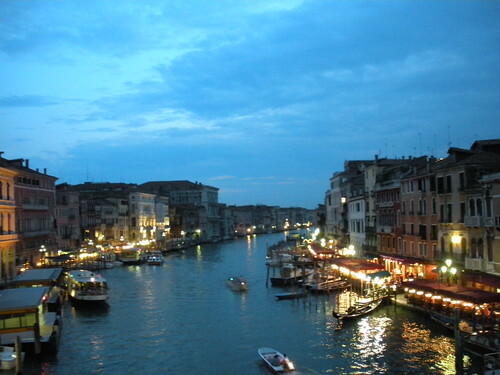 I enjoyed our time in Venice, more in memory I guess than in actual time, but I did enjoy it. Maybe someday we’ll get to go back under better circumstances — when we’re not exhausted and when our little boy is well. Marlowe is doing much better. Thanks for asking!